On Amazon today you can save up to 40% off select Alex and Ani bracelets! 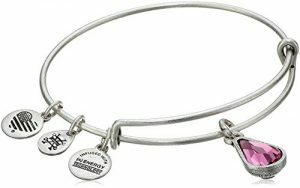 You can get this pretty Alex and Ani October Birth Month Charm with Swarovski Crystal Rafaelian Silver Bangle Bracelet for just $19.86 – a 38% savings! This will ship free with Amazon Prime or qualifies for free Super Saver Shipping with a $25 purchase.